The inferior gluteal artery is the shorter of the two primary artery sections which originate off the internal iliac artery that supplies blood to the whole gluteal area. This specific artery is named for its close distance to the gluteus muscles. The inferior gluteal artery emerges via the anterior trunk of the internal iliac artery inside the pelvic cavity. It exits the pelvic cavity along with the inferior gluteal nerve via the greater sciatic foramen inferior to the piriformis muscle. The inferior gluteal artery circulates oxygenated blood to the gluteus muscles (of the buttock) and the hip joint. This artery also decreases into the thigh area of the leg prior to dividing into the ischiadic artery. 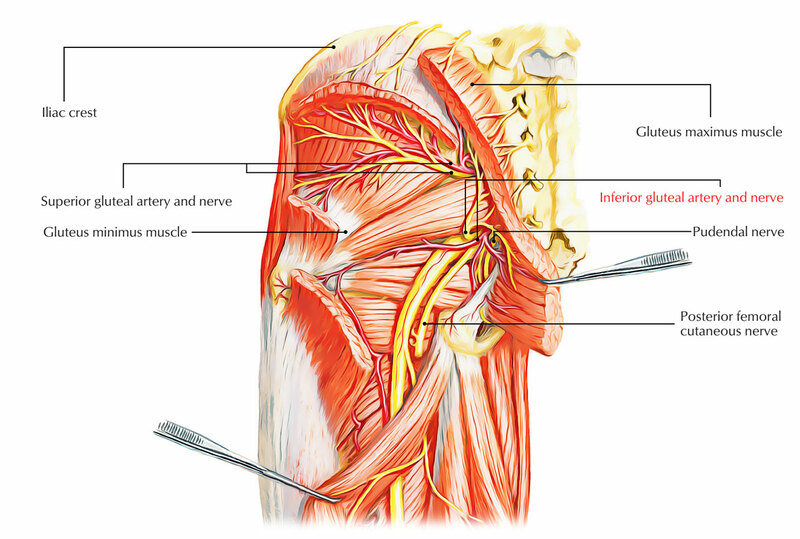 The inferior gluteal artery supplies surrounding muscles and comes down via the gluteal area as well as into the posterior thigh where it supplies nearby structures as well as anastomoses with piercing sections of the femoral artery. It also supplies a section to the sciatic nerve. Muscular divides to the piriformis, gluteus maximus and obturator internus and the superior hamstrings. The companion artery to the sciatic nerve is a section which is a residue of the embryonic axial artery of the limb. It supplies the sciatic nerve. Developmentally this artery is the major supply to the posterior compartment of the thigh, and might often continue as a large vessel. Trochanteric anastomoses: The artery adds to the trochanteric anastomosis, which suffuses the head of the femur. Other supplying vessels consist of the superior gluteal artery and the lateral as well as medial circumflex arteries. Cruciate anastomoses: The inferior gluteal artery supplies contribution to the cruciate anastomosis of the upper thigh, together with the lateral and medial circumflex artery. The anastomotic section of the posterior section of the obturator artery as well as the first piercing artery of the profunda femoris.